If you know me and Sassy, you know that I'm small, Sassy's strong, and she likes to pull--hard. In the past, I've used a prong collar, which, for the first year or so I used it, proved effective. Eventually, however, Sassy grew numb to the pinch, and if she wanted to, say, get in the water, she was going to get in there, no matter how much that collar pinched. So, like many other dog owners, I bought an apparatus that is commonly called either a "head collar" or a "gentle leader." She hates it, but it does the trick. She can't pull as hard, and I get to be in control of my large, strong, overly-friendly dog. There's just one problem. Every time we go out, people assume it's a muzzle, and thus, she must be a biter. If you know Sassy, you know how ridiculous that sounds. She's a jumper, a licker, and a hugger, but as long as you don't try to attack me or break into my home, she's anything BUT a biter. So, ladies and gentlemen, consider this a public service announcement, and please feel free to share this--you might be surprised who all do not know the difference between a head collar and a muzzle. Notice the differences between the gentle leader and the muzzle. One allows a dog free movement of her mouth and full access to her teeth. 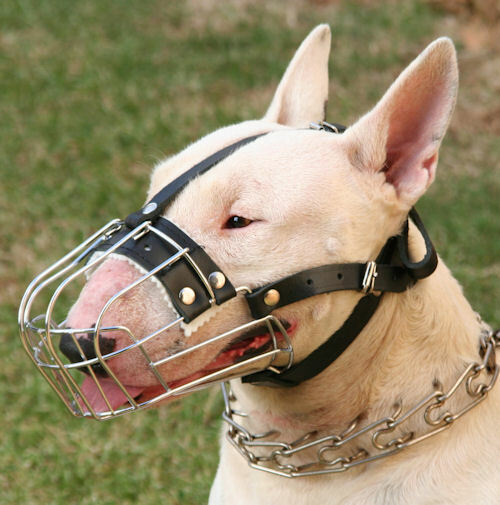 A head collar is a very ineffective muzzle or bite preventative. 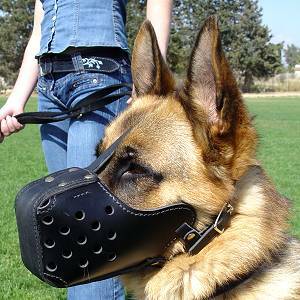 On the other hand, the muzzle, while still allowing the dog to open his mouth to drink or pant, is a closed space. You cannot put your hand in the dog's mouth (fingers are a different story--be smart!). 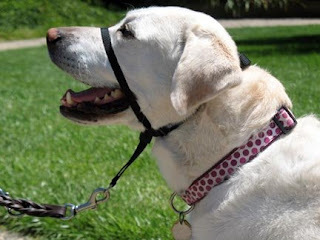 So the next time you see a dog wearing a gentle leader or head collar, resist the urge to assume the dog is a biter and asking the owner, "Does she bite?" First off, take the time to learn dog body language. You should, of course, always ask the owner's permission before petting their dog (and respect their choice if they say no. They probably know their own dog better than you), but for owners of friendly dogs like myself, a loaded question that implies your assumption that a face apparatus means a mean dog, it can sting. Not good questions: "Does he/she bite?" "Does he not like strangers?" Good alternatives: "Your dog looks sweet. Is it alright to pet her?" "Is she comfortable with strangers petting her?" "So why did you decide to use a gentle leader collar?" So, in the future, if you see Sassy and me walking around in a public place, realize she's not wearing a muzzle and would be happy to greet you. Just make sure she's sitting, because she will greet you with complete exuberance, which may result in jumping or unintentional scratches from her paws. Still, please ask first. Again, please feel free to pass this message along.